Priest of the Hosso Sect during the Heian Period. He stayed at the temple Kofuku-ji in Nara, but then went on to Aizu in Northern Japan, where he practised austerities in the mountains. In 817, he wrote the tretease: Bussho Sho. He founded the temple Enichi-Ji in Aizu, now Enichi-ji 恵日寺 . This temple burned down but the town of Bandai is trying to rebuild some of the structures. Enichi-ji Temple was established by Tokuitsu-daishi who diffused Buddhism in Aizu. It is the oldest temple among those whose established ages are identified in Tōhoku region. A plan to reconstruct the temple at the historical site was forwarded, as the ancient Kondō Hall was reestablished in 2008 and has become a symbolic building in Bandai Town.
. Aizu Go Yakushi 会津五薬師 Five Yakushi temples - Enichi-Ji . The temple was founded by Tokuitsu Daishi in 806. 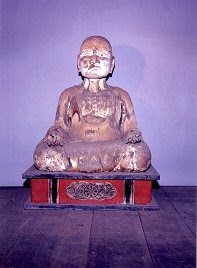 Yakushi Nyorai, the principal image of the Healing Buddha, was brought from Tang by Genkai Ajari. 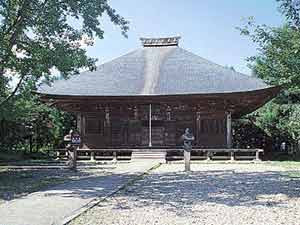 One of the oldest Buddhist temples in the Tohoku region, Shojo-ji was founded by High Priest Tokuichi in 807. The existing "Kodo" Hall, reconstructed in 1398, is known as the "Aizu Central Yakushido." All Buddhist images enshrined here date back to the temple's founding. It is rare that so many early-Heian-period Buddhist images are well preserved at one place. ... the priest Tokuitsu of Japan. He bitterly criticized the Great Teacher T'ien-t'ai for rejecting the doctrine of the teachings of the three periods that is set forth in the Profound Secrets Sutra, declaring that T'ien-t'ai had used his three-inch tongue to destroy 116 the Buddha's five-foot body. The Great Teacher Dengyo in turn attacked Tokuitsu, pointing out that the Profound Secrets Sutra was first introduced to China by Hsüan-tsang in the early decades of the T'ang dynasty. In other words, it was brought to the country a number of years after T'ien-t'ai Chih-che, who lived during the Ch'en and Sui, had already passed away. How then could he have rejected a doctrine that was not introduced to China until the period after his passing? 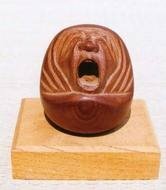 Tokuitsu reduced to silence, but his tongue broke into eight pieces, and he died. In the absence of written records, we cannot be sure when or by whom Enichiji was established. 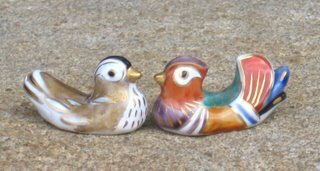 Its two major founding legends claim that it dates from the beginning of the ninth century; and while temples commonly exaggerate their own antiquity, the discovery of ninth-century pottery in remains of Enichiji buildings suggests that the traditional date is not far off the mark. Enichiji's founders, whoever they may have been, built their temple at the foot of Mt. Bandai, a mountain viewed as sacred in local folk belief. The kami (deity) of the mountain was worshipped at BANDAI SHRINE, now located at the site of the Heian temple's central complex. Under its original name of Iwaki or Iwahashi shrine, it appears in the early tenth-century Engi Shiki as a government-sanctioned institution. By this time it is likely that the shrine and Enichiji had formed a close partnership--a common phenomenon in pre-modern Japan, when "Buddhism" and "Shinto" were not clearly distinguished, and temples and shrines often shared the same precincts. At one time an evil spirit lived on Mount Bandai, called at that time the Mountain of Pestilence. The evil spirit destroyed the local rice crops, and if that were not bad enough, a lake suddenly materialized at the foot of the mountain, inundating the houses built there. The imperial court in Kyoto heard about the matter and in 807, dispatched the Shingon Buddhist master Kuukai to reverse the disasters. For ten days, Kuukai performed an ascetic regimen in a village nearby. His practice drove off the evil spirit. Kuukai then renamed the mountain Bandai, and built a temple at its foot to ward off further disaster. Choosing the exact spot through divination, he constructed the temple, enshrining images of the Buddha YAKUSHI, the bodhisattvas Nikkou and Gakkou, and Buddhist guardian figures--the Four Heavenly Kings and the Twelve Generals. Kuukai was then rewarded with a manifestation of the mountain kami, whom he named Bandai Myoujin (Bandai Myojin). A more commonly-accepted story claims that the temple was founded in 806 by TOKUICHI, a monk from the Nara temple Koufukuji who is also credited with establishing several other temples in the area around the same time. The Kuukai legend probably originated in later years, when the temple became affiliated with the Shingon school. We cannot verify Tokuichi's founding role, but a monk or monks from one of Japan's central Buddhist institutions may in fact have established the temple in cooperation with local notables. Like other provincial Buddhist temples, Enichiji may have been a vehicle for extending government power to remote locations. Wary of religious institutions not under its own control, Japan's imperial government in Kyoto incorporated existing provincial shrines and temples into its own systems, or established new ones to "convert" local people and lay claim to their loyalty. Enichiji was not a large temple in comparison to temples in Kyoto or in Nara, the eighth- century capital; but it was large enough to have been expensive to build. Moreover, the central image of Yakushi at Enichiji's nearby sister temple of SHOUJOUJI, thought to be a twin of Enichiji's central image, is an early Heian figure of great sophistication. The elegance of the gilt-wood image suggests that it was made by skilled artists, perhaps from the same atelier as sculptors of similar images in powerful Kyoto and Nara temples. Although the evidence is very sparse, it points to the involvement of the court or court-sponsored Buddhist institutions in Enichiji's founding. Another possible source of support was the regional notable class, composed of both indigenous families and officials dispatched by the court who had settled in the area. The conflicts between local families and powerful newcomers were sometimes settled by establishing common religious institutions, where local deities shared space with those who had come from outside. In any case, once Enichiji was established, local support was crucial to its existence. Local histories such as the Fuudoki list lay representatives of the temple who were allocated income from temple holdings at the end of the twelfth century, presumably in return for protecting temple interests. Enichiji's long period of prosperity--at least through the twelfth century and perhaps even longer than that--suggests that local support was quite powerful indeed. The founding of Enichiji and other Aizu-region temples in the early Heian period may have had a military purpose. During the eighth and ninth centuries, the imperial court made war on the Emishi, people who resisted its control, and pushed them further and further northward. The Emishi fought back fiercely in the Touhoku regions to the north of Aizu. Tagajou, the capital of Mutsu (Aizu's province), was one center for campaigns against the Emishi. The Aizu region does not seem to have been a battle site, but it supplied the court's armies, and a ninth-century mokkan (record written on a strip of wood) recounts the service of Aizu soldiers at Tagajou. Although armies under the command of the legendary hero Sakanoue Tamuramaro largely brought the Mutsu Emishi under control in the early ninth century, they held out for some time in the province of Dewa, just over the mountains north of Aizu. Under the circumstances, it must have seemed sensible for the court and their local allies to construct Buddhist temples in strategic regions such as Aizu. For one thing, converting the Emishi to Buddhism helped to pacify them, since Japanese Buddhism was bundled in a cultural package that engendered a peaceful agrarian life and obedience to central authority. In addition, Buddhist temples served as court outposts, often serving local government functions. It may be legend, not fact, that several Aizu temples were founded in the first decade of the ninth century by Tokuichi, a representative of the central power structure. But the kernel of truth in the legend, perhaps, is that central authorities sponsored temple construction in Aizu to shore up government power in a crucial region. What role did Enichiji play in the political and economic life of the Aizu people? In the absence of definitive evidence we cannot be sure, but several artifacts in the temple's possession--described in Shinpen Aizu Fuudoki but unfortunately now lost--suggest what this role may have been. According to the Fudoki, Enichiji held four gold seals, all said to have been issued by the imperial court--three of them in the ninth century and one in the late eleventh. The seal issued during the reign of the Emperor Junna (r. 823-833) is inscribed "seal of Amarue village"-- designating, perhaps, an as-yet unidentified village in the Aizu region. The historian Takahashi Tomio explains that the holder of a village seal had to be a district or village official, indicating that the temple performed some local government functions. Another artifact described in Fuudoki that indicates the temple's public authority is a stick nine sun eight bu in length (one sun = approximately 1.2 inches; one bu = 1/10 sun). About five sun of the stick is notched to make a ruler in a standard length for the period. Enichiji's possession of this type of ruler, used in government land surveys, suggests that the temple supervised the distribution of land in the surrounding area. As a religious institution, Enichiji centered its rituals on Yakushi, the Buddha of healing. The practical aspects of a healing cult made the worship of Yakushi popular in the Nara monasteries, and easy to spread northward. One of Enichiji's sources of power, perhaps, was that its main object of worship soothed the fear of disease. In the Heian period, moreover, Enichiji adopted tantric Buddhism, with its emphasis on magic and ritual and its natural appeal to people of all social classes. Although tantric practice affected almost all Buddhist institutions in Japan in the Heian period, it is largely associated with the Tendai and Shingon schools, introduced into Japan from China at the beginning of the ninth century. Tendai and Shingon soon came to rival the formerly-dominant Buddhist schools located in several great monasteries in Nara. . . . The new schools both expanded their influence into the Touhoku region, and Enichiji probably affiliated with one or the other in mid-Heian-- Tendai initially, perhaps, and later Shingon. Enichiji prospered throughout the middle and late Heian periods. A medieval painting depicts the temple in its days of glory. During the eleventh and twelfth centuries, however, another complex of politico-religious power was arising further to the north. This was the famous HIRAIZUMI, home to the regional warlords Northern Fujiwara and their temple Chuusonji, a center of Pure Land Buddhism--the worship of AMIDA. No doubt the Northern Fujiwara wanted to extend their influence to Aizu but they do not seem to have done so before the end of the twelfth century. In the Kamakura period, some religious sculpture--such as the Amida image at GANJOUJI in Kitakata -- followed the Hiraizumi style, but that does not seem to have been the case in Heian times. The political and religious power of Enichiji probably stalled the extension of even the cultural influence of Hiraizumi. If this was so, how did Enichiji hold out against the powerful Fujiwara warlords? One way was to make an alliance with other warlords, and apparently this is what the temple did. Under the leadership of Joutanbou, who commanded Enichiji's soldier-monks, the temple combined forces with a warrior family called the Jou. This, according to standard accounts, was the beginning of Enichiji decline. After their victory in the Genpei War made the Genji under Minamoto Yoritomo the paramount military power in Japan, Yoritomo placed the Aizu region under the control of his followers. Did Enichiji then lose its holdings as is sometimes claimed? It seems unlikely that it did, since the medieval painting provides evidence of Enichiji prosperity throughout later ages. A team of historians and computer specialists from the University of Aizu (Aizu-Wakamatsu, Fukushima Prefecture, Japan) and from Applied Cad/Art (Eugene, Oregon, USA) is developing educational software on Japanese history, focusing on the Aizu region. was a scholar-monk of the Hossō sect of Buddhism in Japan. He is best known for his debates with other leading Buddhists of the time, Kūkai and Saichō, and for asserting a more orthodox view of Mahayana Buddhism based on the state-sanctioned schools of Nara, Japan. Little is known about Tokuitsu's early life, but records state that he studied Hossō doctrine at an early age at Kōfuku-ji, then later Tōdai-ji. His teacher is believed to be the eminent scholar Shūen (769-834). Saichō writes that Tokuitsu left the capital at age 20, and resided in the outer provinces in eastern Japan, apparently at the temples of Chūzen-ji in Tsukuba and Enichi-ji in Aizu. The bulk of his writings were concerned with challenging the Ekayana, Tiantai doctrines espoused by Saichō. Where Saichō advocated the notion of universal buddhahood in all beings, Tokuitsu countered with the orthodox Hossō view that buddhahood is not inherent in all beings, but can be awakened through the Dharma. In time the debate grew heated, and insults were exchangd with Saichō criticizing Tokuitsu as "one who eats only coarse, meager food [allusion to the Pratimoksha monastics precepts], while Tokuitsu criticized the patriarch of Tendai Buddhism, Zhiyi of being a "country rustic". By contrast, Tokuitsu's correspondences with Kūkai were more cordial, but letters by Tokuitsu expressed great interest, but persistent confusion and doubt over Kūkai's teachings surrounding the Dharmakaya. Kūkai, respecting Tokuitsu's authority, maintained a more humble, conciliatory tone, and sought to assert the validity of his esoteric-only teachings. Tokuitsu conceded some points to Kūkai's argument, but remained unconvinced otherwise. Is was known for his very long nose. It is said that Priest Tokuitsu, who was the first at Mount Tsukubasan and founded 筑波寺 Temple Tsukuba-Ji, turned into a Tengu.
. Tsukubasan 筑波山 Mount Tsukuba-San .
. Myoohooji 妙法寺 Myoho-Ji . The temple was founded by priest Tokuitsu in 807. Aizu Goshiki Fudo - Five Colors, Five Temples . He is listed as Nr. 06.